Refinery. 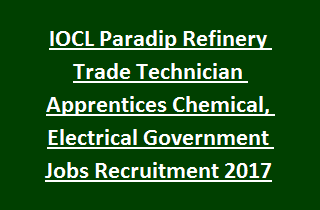 Candidates with essential qualifications can apply for this IOCL Refinery Apprentices Jobs may go through the IOCL recruitment link www.iocl.com. Download the application form and submit before closing date. Online application link opens from 28-10-2017 and closed on 11-11-2017. Indian Oil Corporation Limited will offer monthly salary Rs. 2500/- towards Stationery, Miscellaneous, Conveyance and other allowances. Applicants will be selected for this Apprentices Jobs is based on written test and Personal Interview. Indian Oil Corporation Limited IOCL Trade Apprentices, Technician Apprentices (Electrical/ Mechanical/ Instrumentation/ Fitter) Recruitment Notification details, Eligibility Criteria, Selection process, Age limits, Application Procedure are given below. Total Available vacancies in IOCL Paradip Refinery Recruitment are 91 posts. 1. Trade Apprentice/ Attendant Operator (Chemical Plant): 20 posts. 2. Trade Apprentice- Fitter (Mechanical): 05 posts. 3. Technician Apprentice (Chemical): 30 posts. 4. Technician Apprentice (Mechanical): 10 posts. 5. Technician Apprentice (Electrical): 20 posts. 6. Technician Apprentice (Instrumentation): 06 posts. Technician Apprentice: 3 years Diploma in Chemical/ Mechanical/ Electrical/ Instrumentation/ Instrumentation & Control/ Instrumentation & Electronics Engineering. Trade Apprentices/ Attendant Operator: 3 years BSc degree in Physics/ Mathematics/ Industrial Chemistry/ Chemistry discipline. Salary for all Apprentices posts is Rs. 2500/- per month towards Stationery, Miscellaneous, Conveyance and other allowances. Maximum age limit is 24 years and minimum age limit is 18 years. Age will be relaxed as per IOCL Govt rules. Candidates will be selected for this IOCL Apprentices Jobs is based on written test and Personal Interview. Candidates are required to meet Medical & Physical fitness standards. Candidates who meet the prescribed qualifications have to visit IOCL official website www.iocl.com. Open the recruitment link, click on relevant discipline. Read the full details of advertisement before filling the application form. Online application forms opening date is 28-10-2017. Last date for the online registrations is 11-11-2017. Last date for the receipt of application forms with supporting documents is 18-11-2017.